Hello, dear ones. It’s Clyde with another Black Cats Tell All Monday. I’m honored and frankly flattered by all your kind comments to my 19th birthday celebration post. Never mind me. I’m grooving on the full moon and eclipse energy. In honor of MLK Day. All I want to say is: Hello humans, cats don’t care about the color of your skin. We are color blind. That’s all. Today I’d like to shine the light and give the star treatment to an amazing cat who belongs to one of our blog subscribers, Lizabeth Nash Setliff. We’ve always said we have the best subscribers anywhere. Smart, informed, caring and not only about cats but the planet. We like doing random giveaways and others contests sent exclusively to subscribers. Our latest one was a featured star cat contest. We asked for two photos and some background about the cat. The very first response was a clear winner. You know what they say about early birds getting the worm. If you didn’t win, stay tuned and open your emails from us for the next call. Without further adieu, I’m thrilled to share more about a cool cat with a very unusual background. Say hello to our winner, Caddie! At first glance Caddie aka Wampass may seem like a regular tabby and white boy. 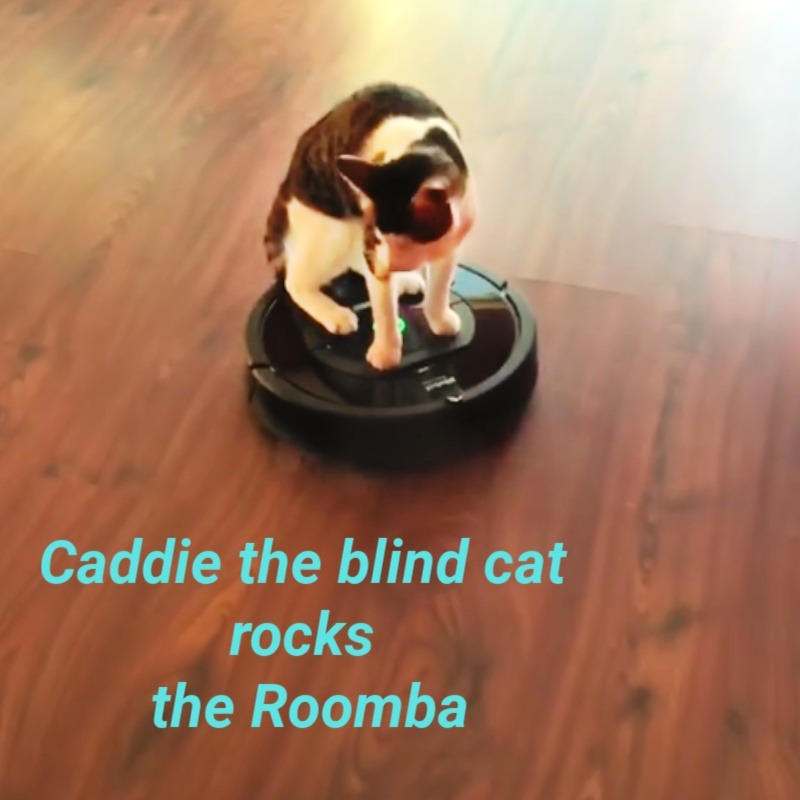 He loves to ride the Roomba as much as any viral video star and run like the wind on his Maclaw Wheel. You’d never guess until you take a closer look that Caddie has no eyes. 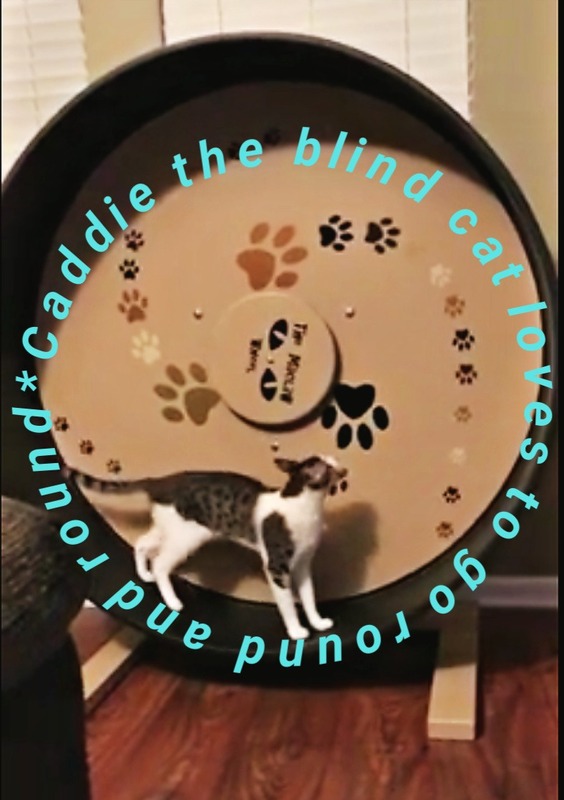 Like the late great Homer the blind cat or Oskar the blind cat, Caddie shares their fearless joy of life. We’d love to share his videos but the Instagram account is private. Here are two screenshots. This boy may love running but he’s he’s also a globe trotter. Caddie was born in Doha, Qatar and adopted while Lizabeth and her husband were stationed in the Middle East. Caddie could have easily wound up dead before reaching adulthood. Born feral, rejected by his mother but rescued by Kaz Mitchell, a dear friend and fellow cat rescue advocate of Lizabeth’s. 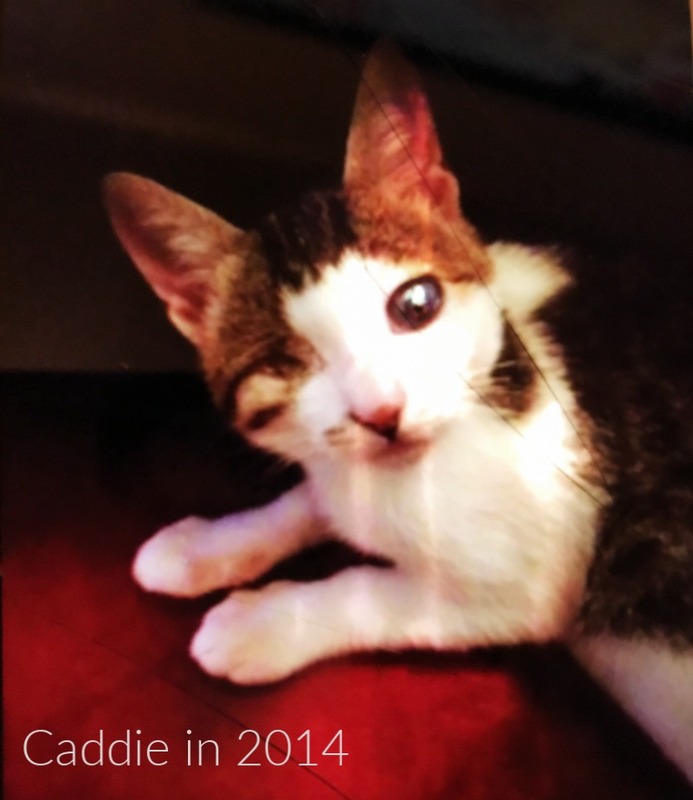 Caddie’s eyes were very diseased but he had a strong will to live. Kaz tried everything to save his eyes but the vet said it would be best to perform an eye enucleation (surgical removal of the eyeball). Eye infections in feral kittens are rampant the world over but more so in areas where TNR isn’t common. Kaz was leaving for Japan and could not take Caddie so she posted his pic on Facebook asking if anyone might adopt him. Lizabeth took one look and fell instantly in love with him. At that point, a tiny, one-eyed cat in Doha didn’t have great odds of being adopted and he joined his new family which included Lulu. 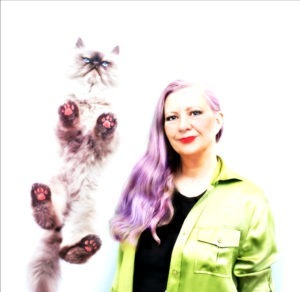 Read our interview with her, the Friskies Award semi-finalist. Cats in the Middle East, contrary to exotic notions of being worshiped as gods struggle to survive. Some are pampered pets but many are feral, abandoned or maligned. Despite economic wealth, there isn’t an abundance of veterinary or other services. Liabeth followed the veterinarian’s orders and administered eye drops but treatment failed and his other eyes needed to be removed. 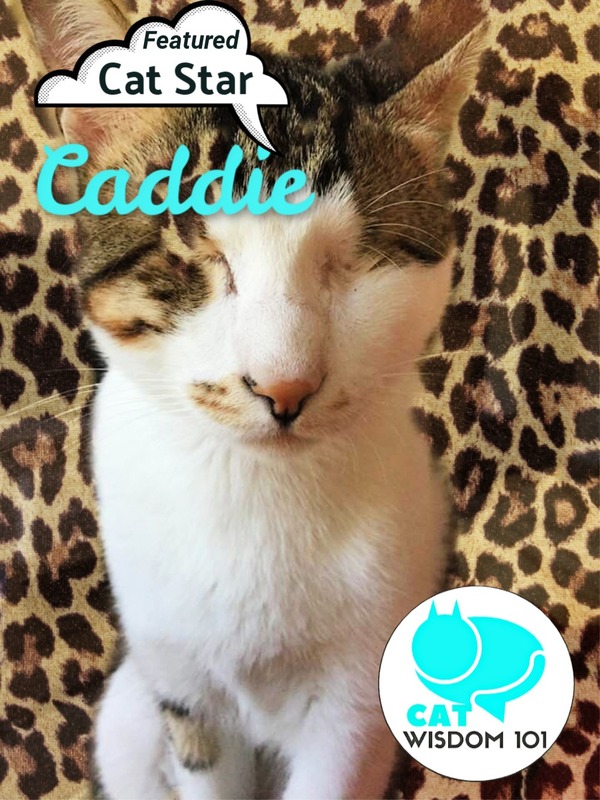 He adjusted beautifully to being blind says, Lizabeth, “Caddie ultimately is the most inspiring, brave, impressive, fearless, precious cat. He is my pride and joy. He teaches you to just get on with life. A blind cat is worth just as much as a cat with eyes that see. When the time came to move back to the U.S. they not only brought back their cats but a few extra lucky street cats. The 13 lucky fursibs live in Orlando, Florida now. Hello dear U.K. readers. Check out The PAWS RESCUE organization in Doha has some adorable rescues for adoption and flight angel program. They have a U.K. office as well. Apparently, Caddie is the most playful and smartest of the gang, able to open drawers and open to adventure 24/7. He sounds like he’d be an ideal playmate for my one-eyed furbro, Odin who would like to remind everyone Jan.22 is Answer Your Cat’s Question Day. Well, I’ve got a million questions besides why are humans slow to learn new habits? 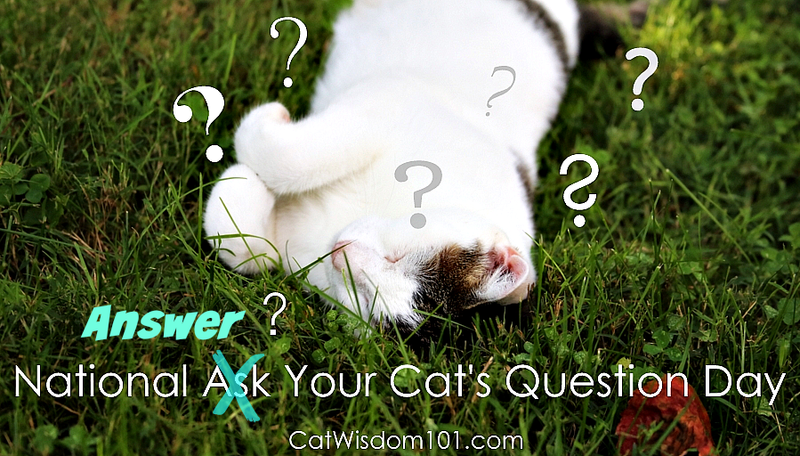 Ask your cat and tell us: What is the most pressing question on your cat’s mind? Curious cats like us want to know. P.S. Our handy dandy subscribe box. Odin would love to include you. Caddie is a cutie. Glad he was rescued. Caddie is one amazing boy. He is a sweety too! Extra purrs for the family rescuing 13 cats and giving them a good life. Indeed. Having an extra large fur family is an enormous undertaking and commitment. I’d love to share more about the journey to travel from Qatar to the U.S. with multiple cats. First congratulations to Caddie! You deserve it cause you are so sweet too! I know him personally cause I’m Lizabeth’s sister. It’s so true how absolutely smart he is and he sure is in love with Liz and Skip. Thank you Liz and Skip for all you do for kitty’s. They have even found colonies and have had cats fixed and freed and continue to feed. Caddie is way beyond a cool cat fur sure. Thank you to Kaz for the initial rescue and thank you to Lizabeth for not only saving Caddie but the other 12 street kitties also. Who says 13 is an unlucky number, doesn’t seem that way to us. Luvs and Purrs to everyone out there that takes a step to help an animal! If we all could purr the bad things away we surely would. Thank you Layla for sharing this wonderful story! Thanks so much for stopping by. Rescue as you know takes a coordinated effort but so rewarding. What an awesome rescue story! Caddie is really one of a kind. Caddie is awesome! We love that his story has such a happily ever after to it. I had the honor of hanging out with Caddie for a week. It is totally astounding what this precious blind kitty is able to do. Amazing instincts; so smart. Congratulations Liz and Caddie! As one of Liz’s five sisters, I would like to say that we are so proud of Liz for her dedication to the cat community, and our 12 four-legged and one three-legged family members. Hi Cindy. Lizzy said you stopped by to comment.Nice to meet you and lucky you spending time with Caddie in purrson! Concatulations, Caddie! What a happy ending to your rescue story. Hugs to Caddie n Congrats! Aww, Caddie is so cute, and it’s wonderful that he’s living the good life now. He sure is xo. Thanks for stopping by!